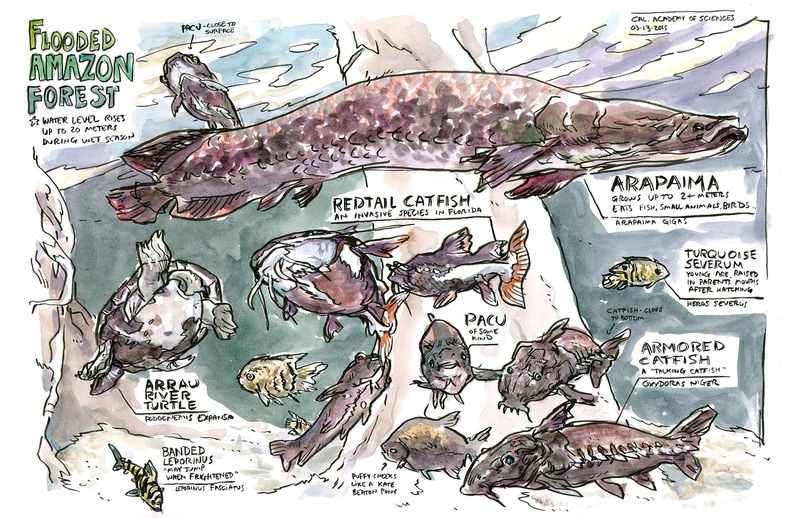 ...and then scaled up to 11x17 paper for a montage of fishes from the flooded Amazon forest exhibit. 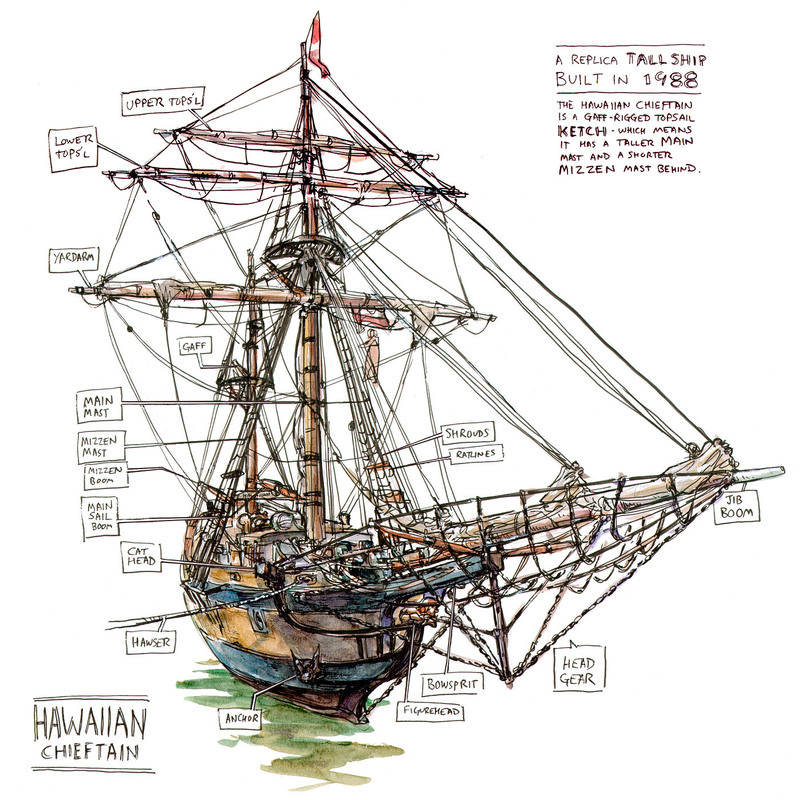 ...I went to Sausalito with the SF Sketchers meetup group, and spent the afternoon on this fully labeled drawing of the Hawaiian Chieftain. 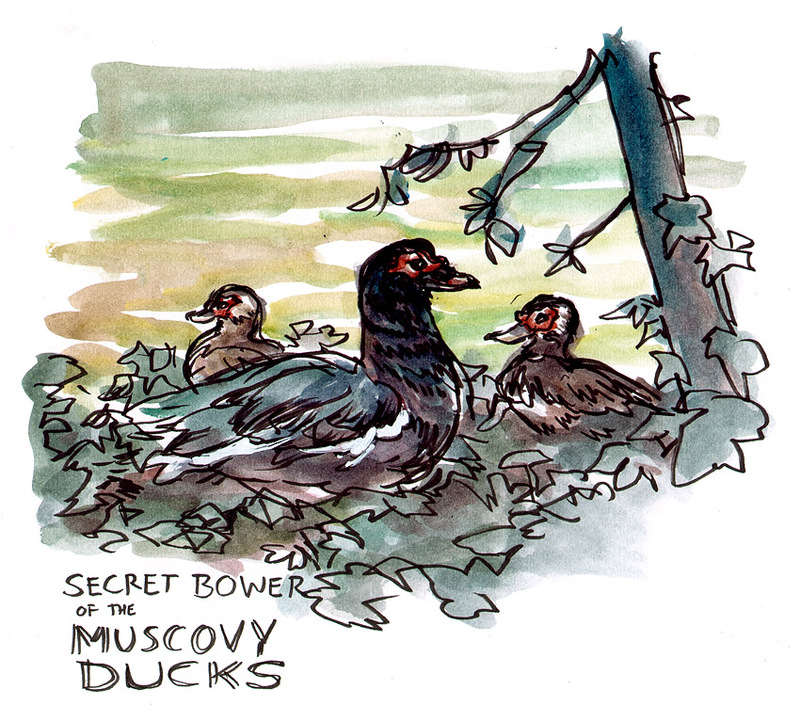 ...where you'll find many gorgeous Muscovy ducks. 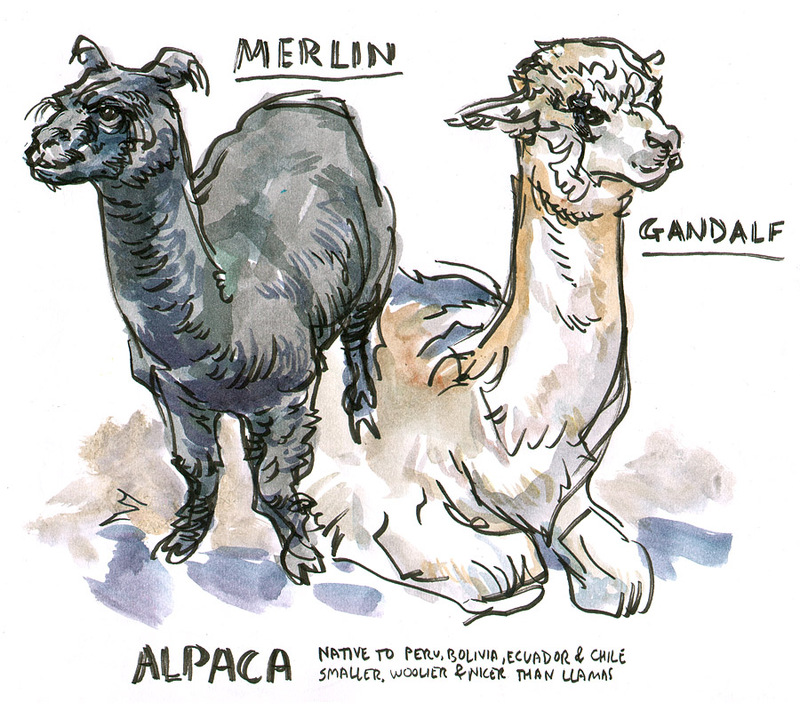 It's been a while since I've gotten out to the San Francisco Zoo, but I did pay a quick visit to these fine alpacas. Oh, and somewhere along the way, Julie and I went to the American Conservatory Theater to see the very interesting Mr. Burns, a Post-Electric Play. I guess it really has been a busy month! Because a full day of costumed character drawing wasn't enough, I stuck around downtown San Francisco for the traditional Chinese New Year parade. 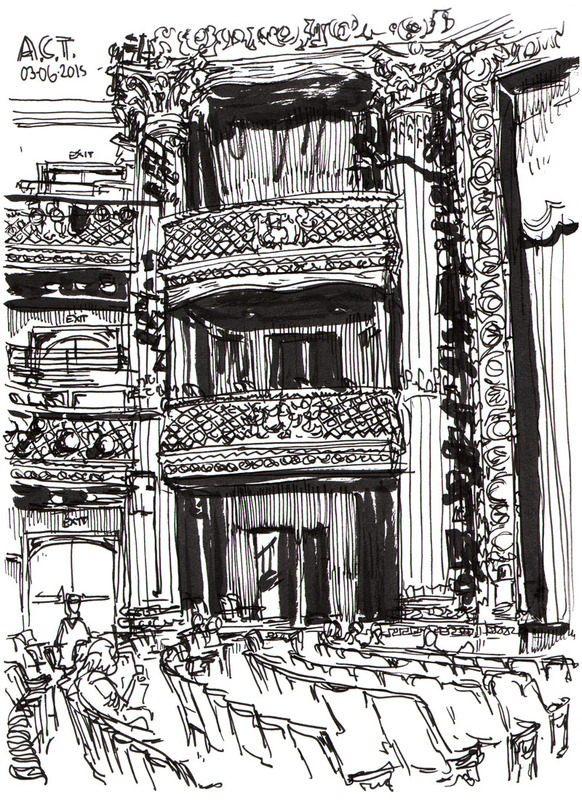 The gradual gathering of the expectant crowd was a great opportunity for creep-sketching. The parade, part one! Clearly a montage was the only way to go. Thanks for the extra bling, metallic Sharpies! 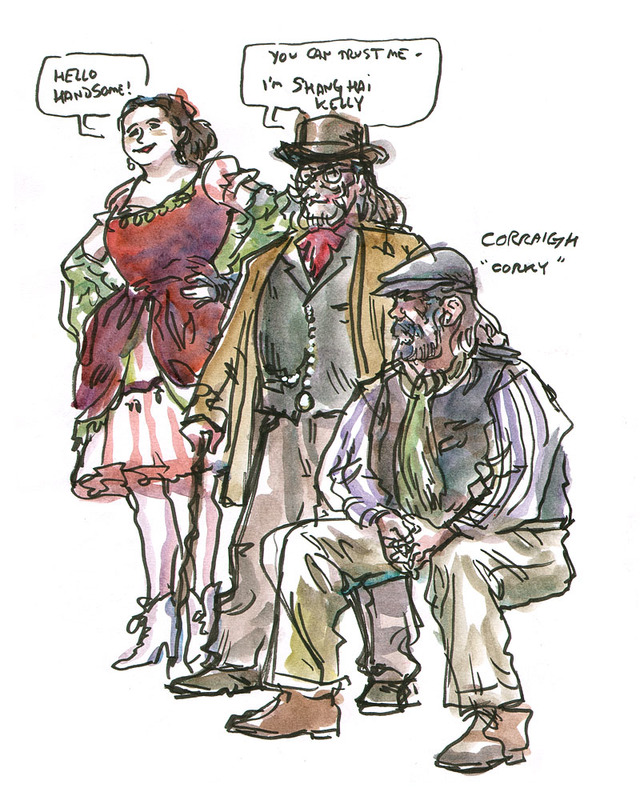 Cartoon characters recreated in the March 2015 Costume Carnival, hosted by the Academy of Art's Illustration department. 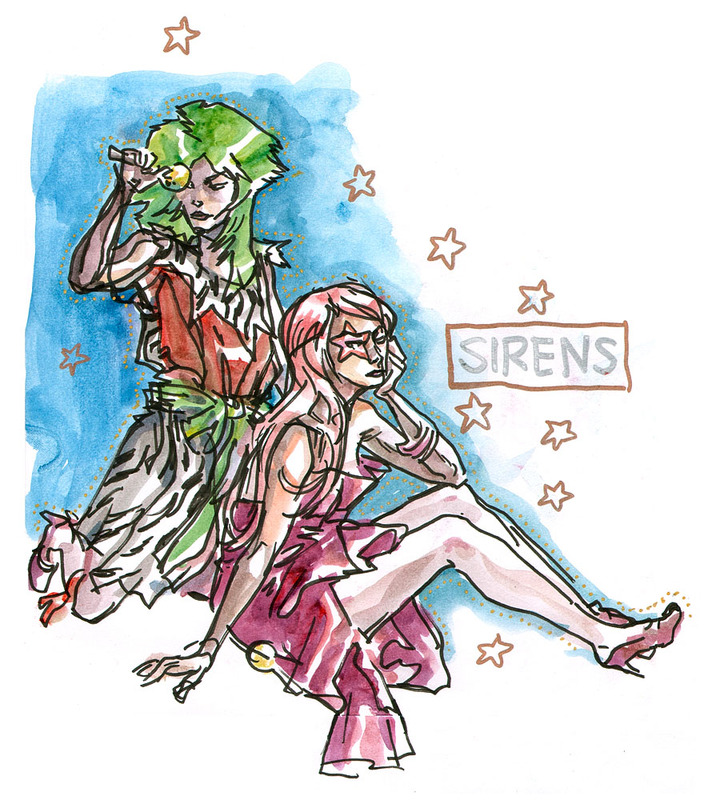 Thanks to model coordinator Sarafina and her amazing models for another wonderful drawing event! 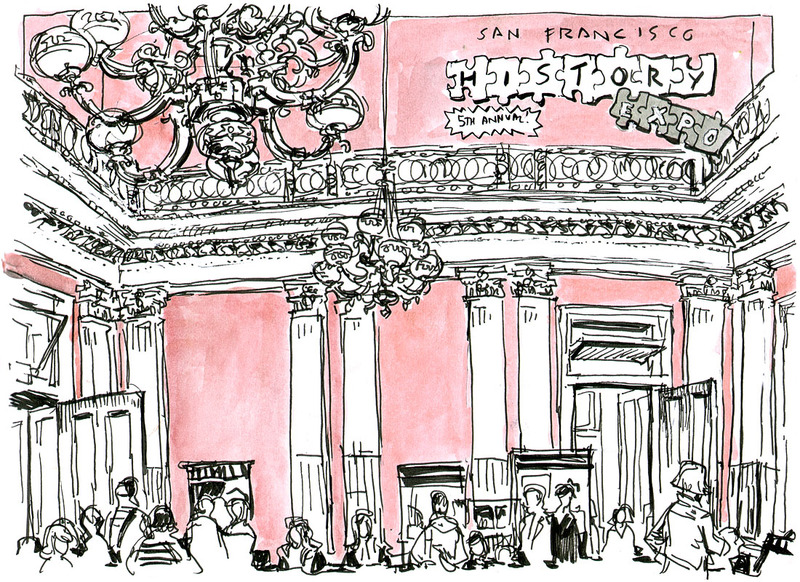 The night before, I'd been to see "Mr. Burns, A Post-Electric Play," at SF's American Conservatory Theater. Looking at all these classic cartoon characters, I couldn't help wondering how they'd play out in a mythological context. 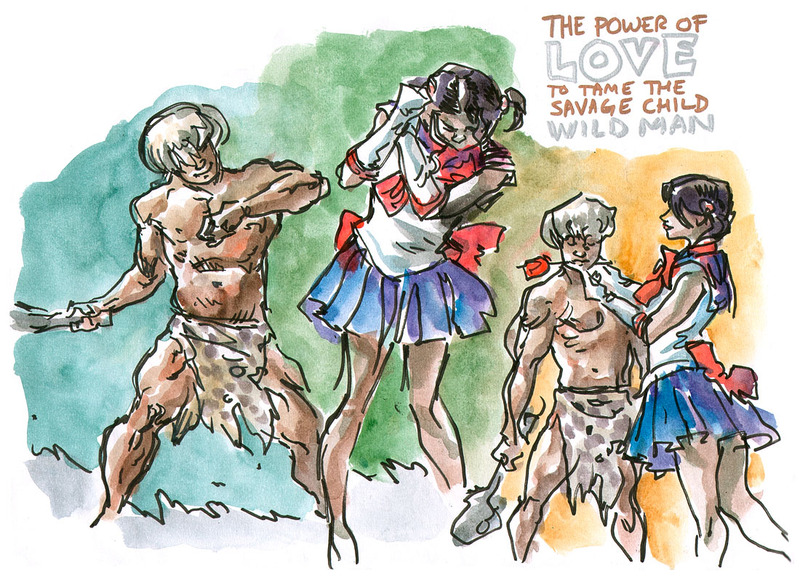 Isn't the conflict between Bamm-Bamm and Sailor Moon a bit like the domestication of Enkidu? 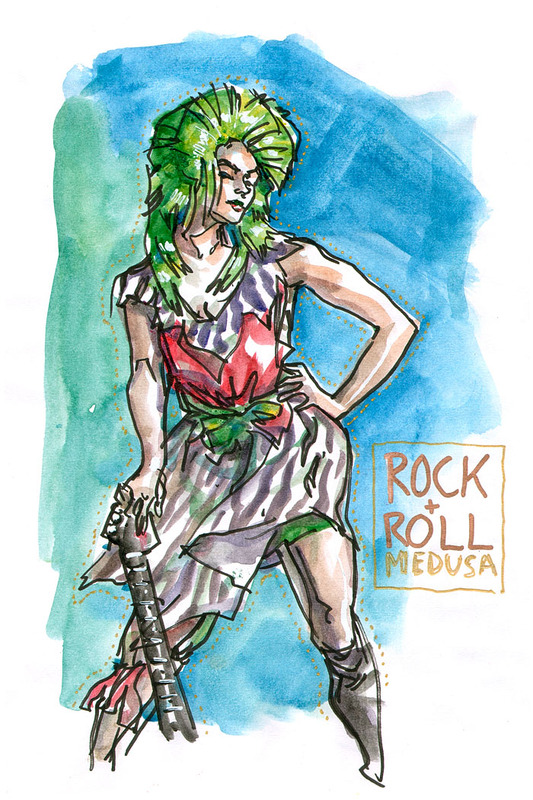 And while I was thinking along those lines, this fabulous Misfit struck me as a kind of punk Gorgon. 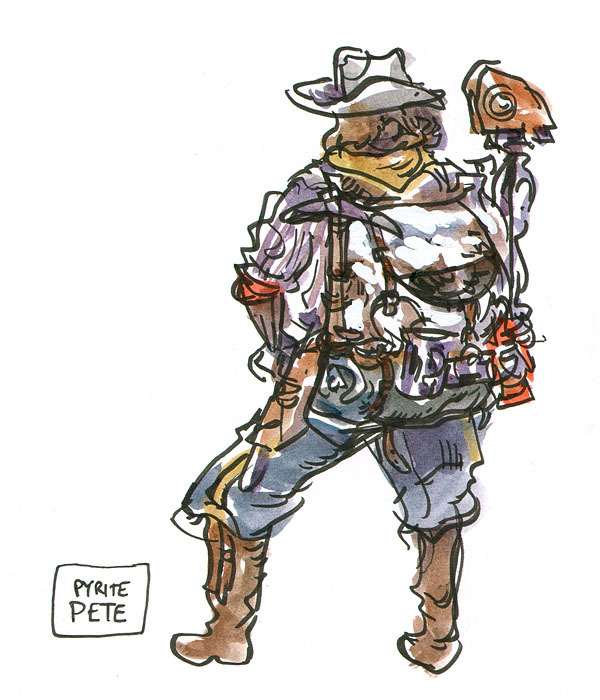 Incidentally, I'm pleased by how well those metallic Sharpie pens showed up in the scans. As portrayed by Sarafina, Jem seems too stylish and sassy for a goody-two-shoes heroine. I think this is a better mythological role for hologram pop stars. 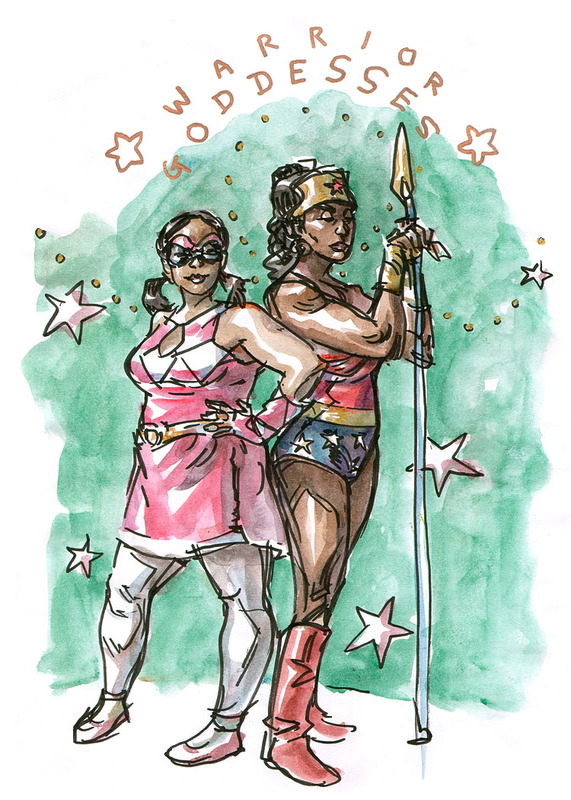 The Pink Ranger and Wonder Woman? Well, that's straightforward enough. 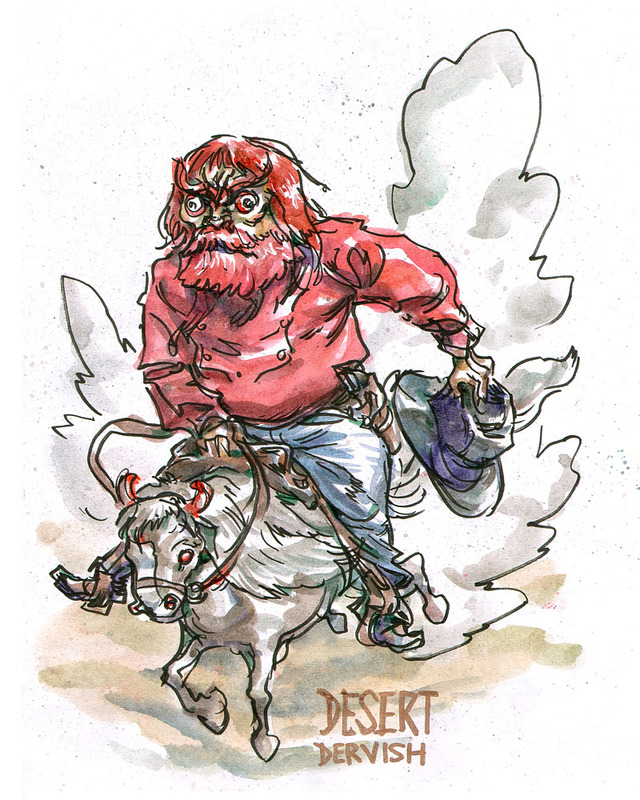 Our Yosemite Sam sported a ferocious fake unibrow which reminded me of a Chinese lion dancer. And then this happened. 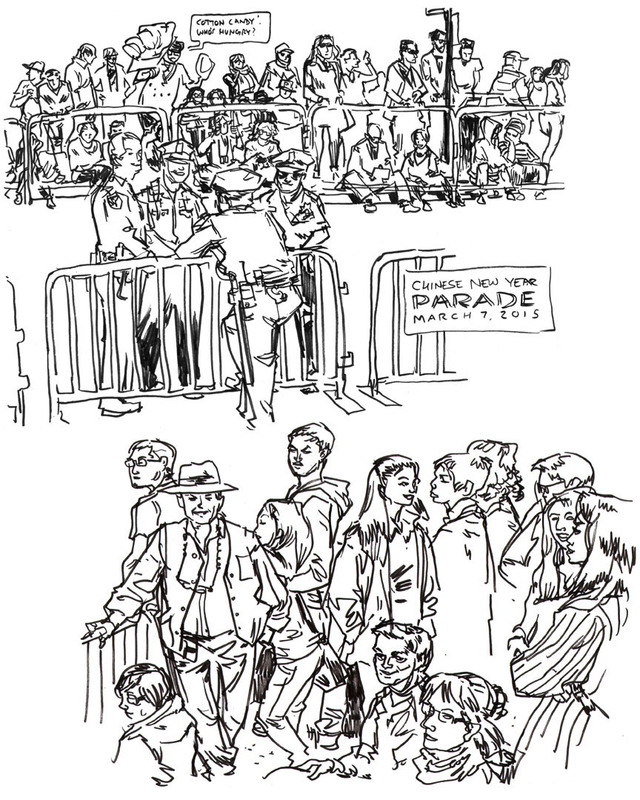 Finally, I took a break from the high-concept character renditions to try and document the entire Costume Carnival in a single two-page montage. It was exactly like this, I tell you! 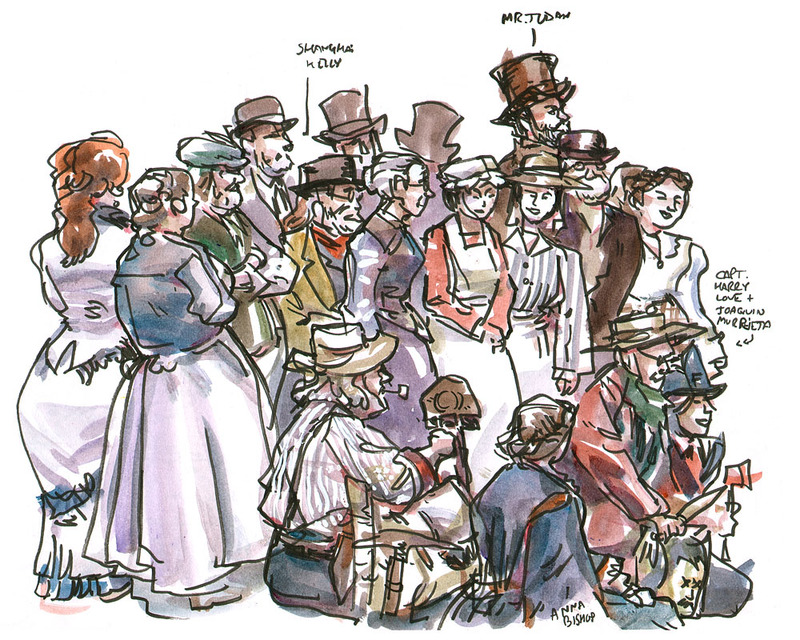 A weekend expedition to the San Francisco History Expo, with Laurie Wigham and the SF Sketchers meetup group - plus a cast of dozens of costumed reenactors, wow! The expo was held inside the historic Old Mint, giving us a rare chance to admire the gorgeous architecture. The costumed reenactors took turns out front hawking the expo to passers-by, which made it hard for me to tear myself away and go inside. They were mainly from the wonderful local group Actions Past. I was fascinated by the gold prospector's elaborate kit bag. 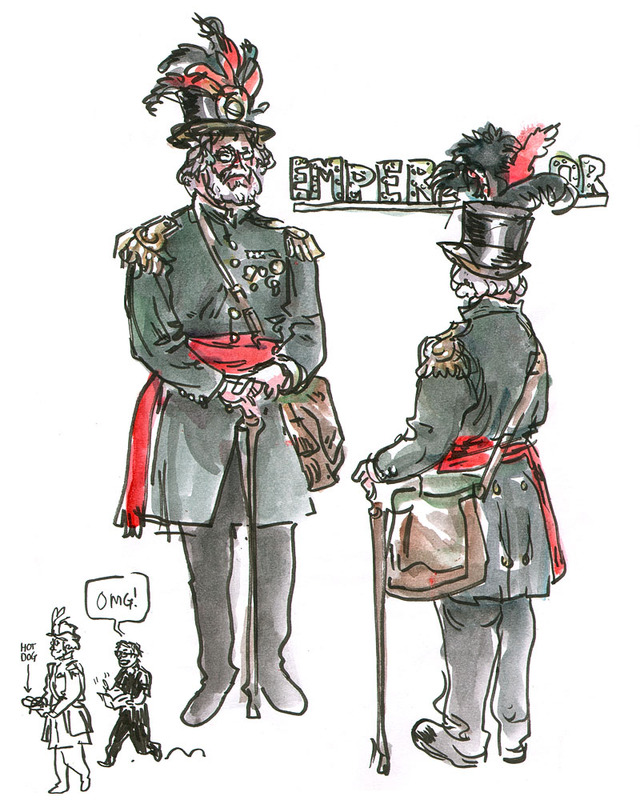 I spent a lot of time stalking Emperor Norton like a sketchbook-wielding paparazzo. You can book him for a city tour at Emperor Norton's Fantastic San Francisco Time Machine. 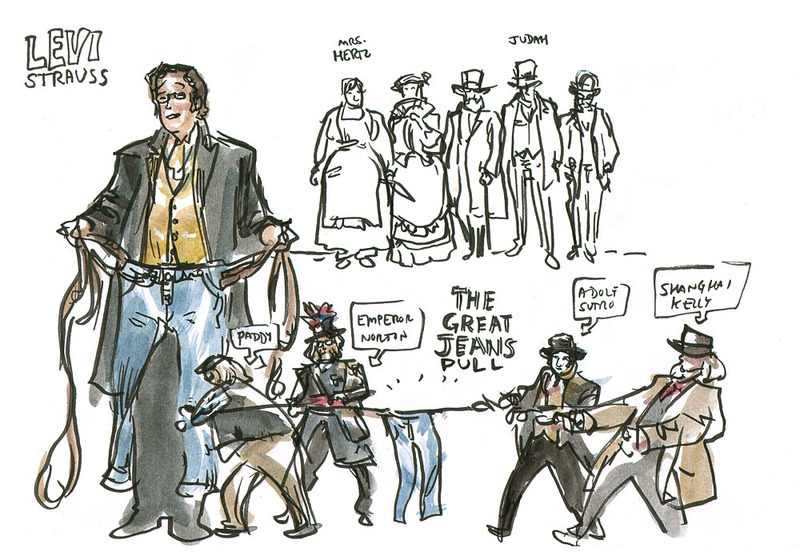 Levi Strauss presented a stress-test of his newfangled "blue jeans" in the courtyard. A constellation of historical luminaries lent their muscle to the demo. 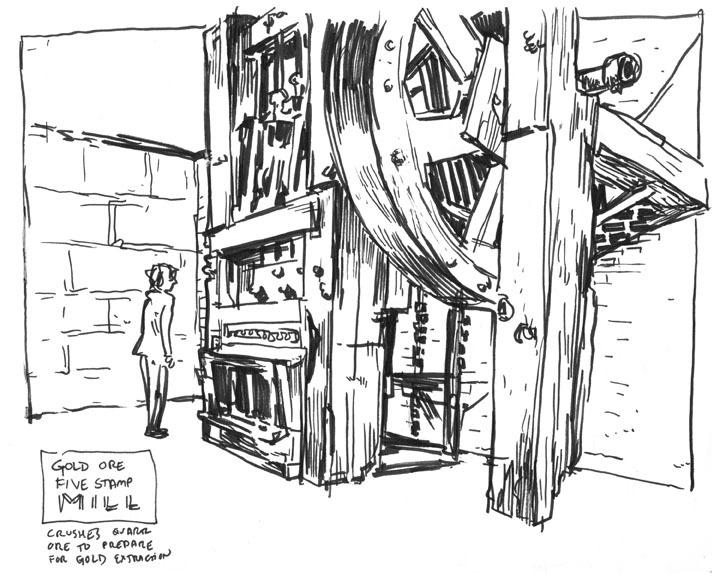 An immense stamp mill in the basement of the Old Mint. 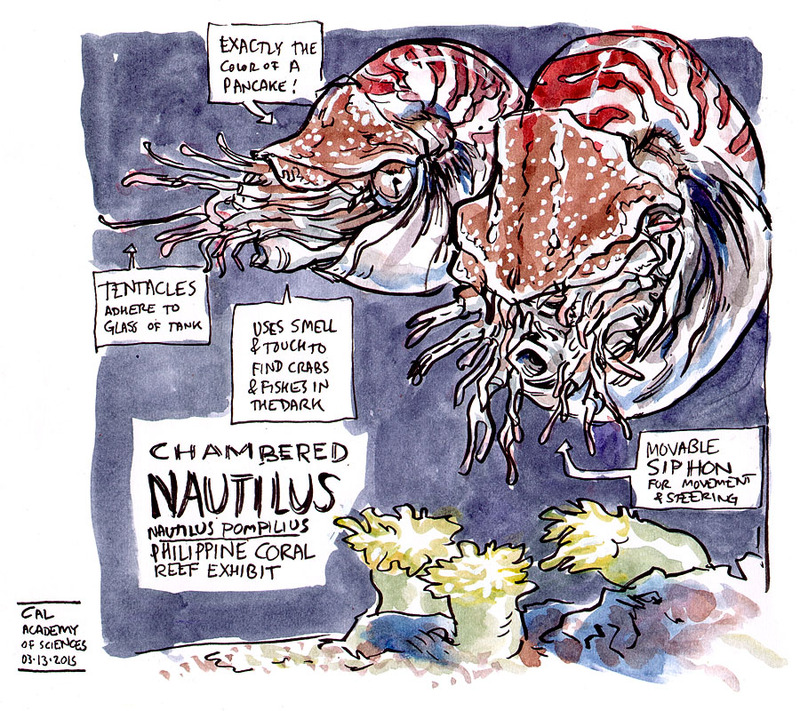 A lot of the SF Sketchers artists gravitated to this impressive piece of hardware. 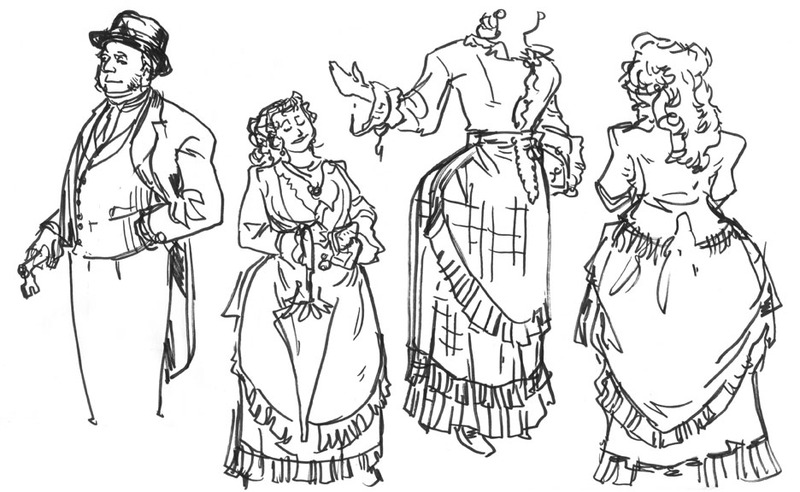 A few quick sketches of the Actions Past reenactors. They gave me some helpful historical hairstyling tips, too! 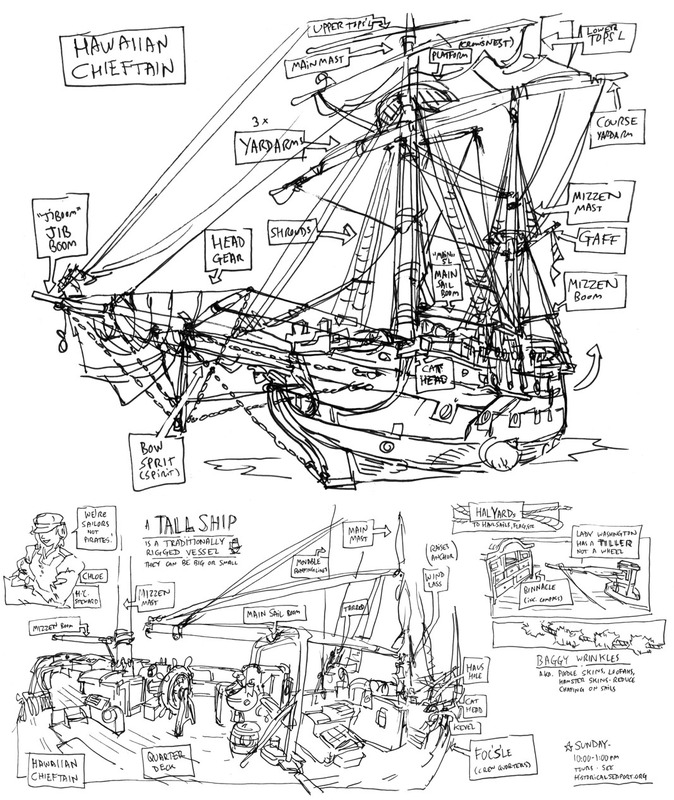 At the end of the day, the Actions Past crew gathered in the courtyard for a group shot, while I sketched away at top speed. Time for another day trip to the San Francisco Zoo. I came for the snow leopard lecture, and stuck around for the birds and sheep and crazy koala action. 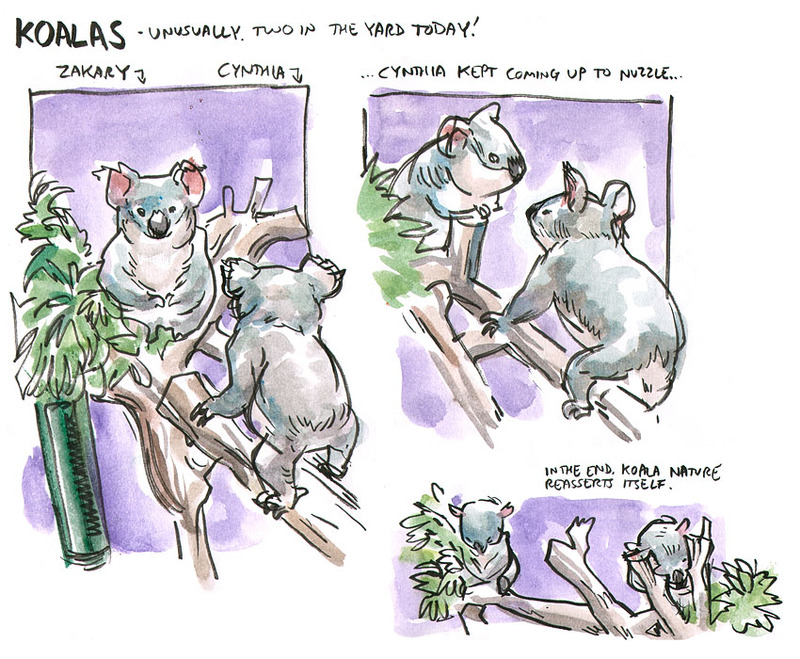 I always like to check in on the koalas first thing, just in case they're awake. 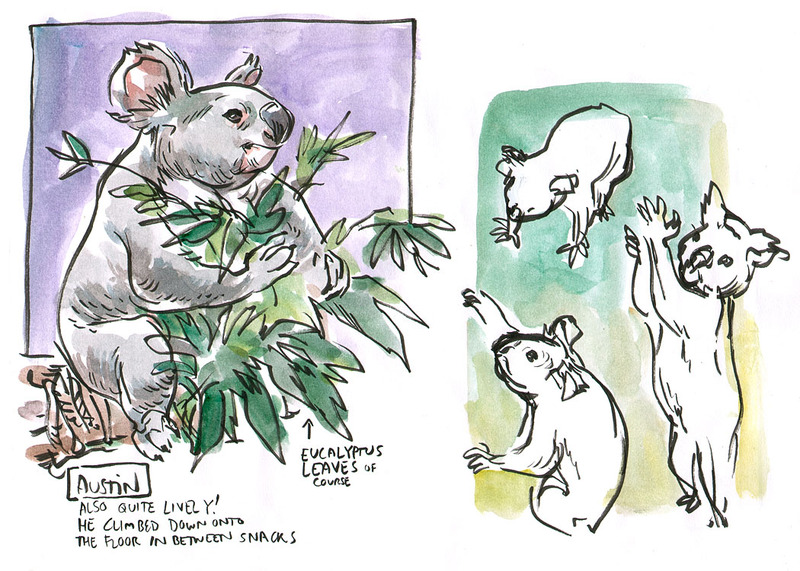 To my amazement, I think I saw some actual koala courtship! Even Austin, who was chilling indoors, was getting up to all kinds of acrobatic derring-do. 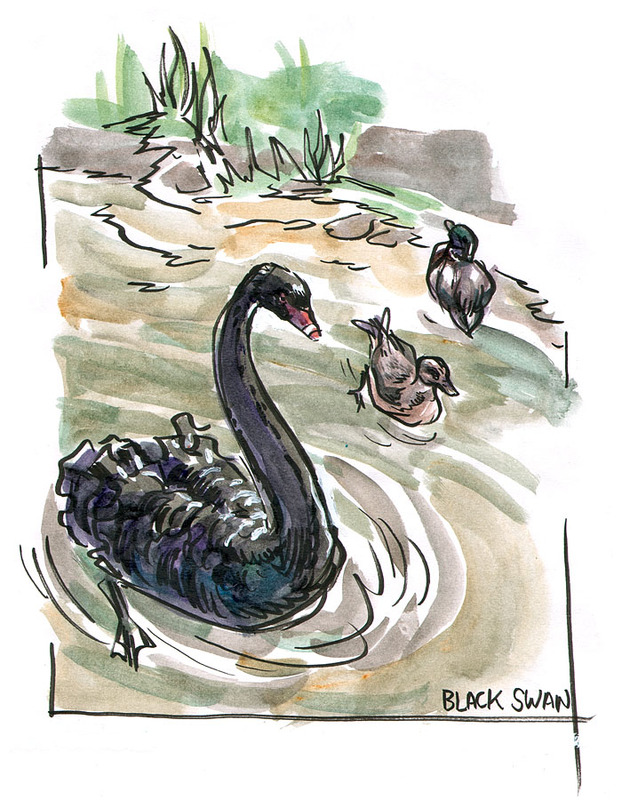 For some reason, the South American exhibit also hosts this elegant Australian black swan. Plus, enjoy a guest mallard and lady wigeon. 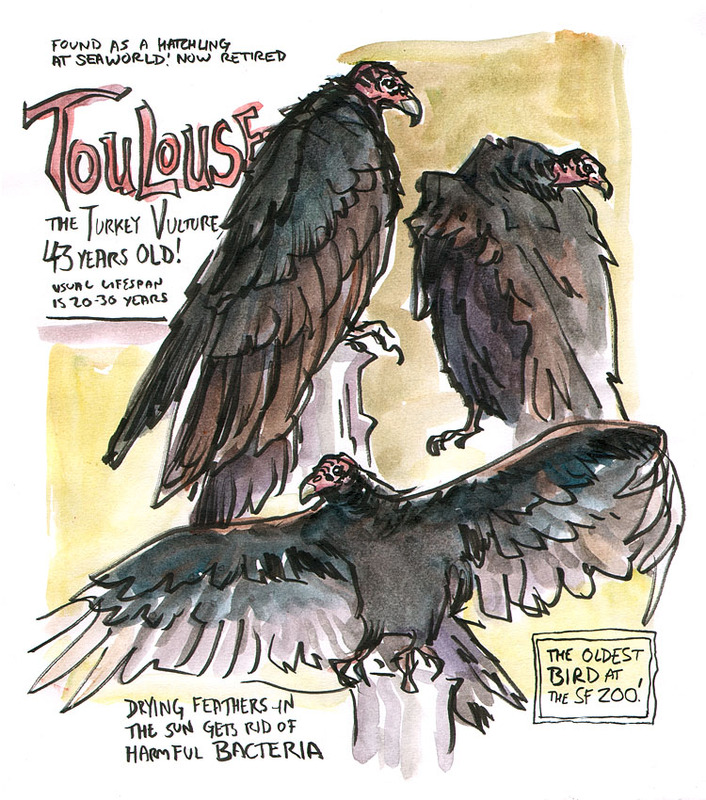 At the Animal Resource Center, I finally got around to drawing the fabulous Toulouse, who gave me some excellent poses. 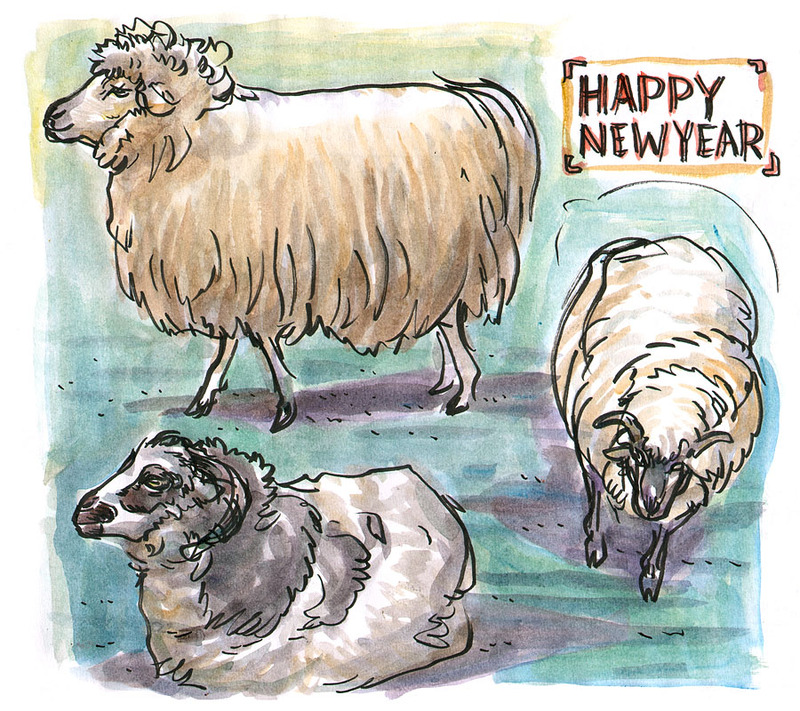 And here are your obligatory sheep for Chinese New Year. 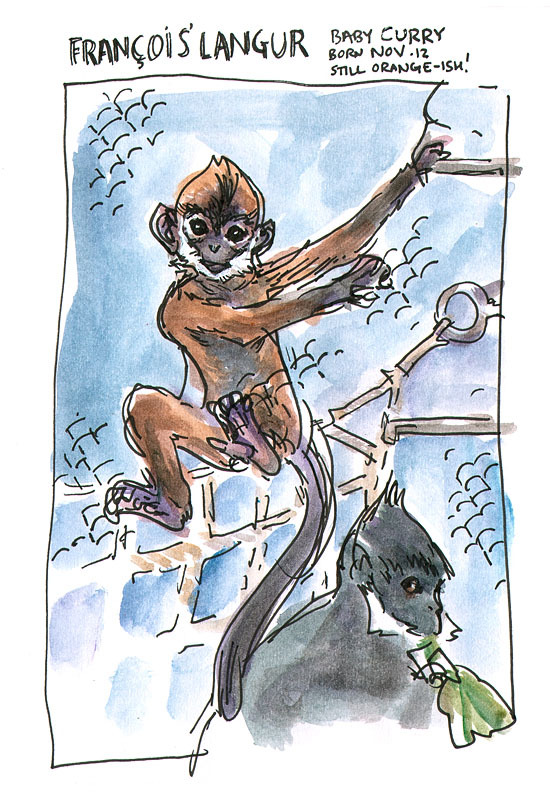 It's a quixotic quest trying to draw the hyperkinetic baby langur, especially now that he's jumping around so nimbly under his own power, but this is probably as good as I'm ever going to get.